The Centurion Hindu Society successfully hosted Pretoria’s very first Mahatma Gandhi Peace Walk on Sunday at the Centurion Rugby Club, Lyttelton. The inclement weather did not deter just over 200 participants arriving at the start-line, ranging from babes-in-prams to senior citizens. Exciting items of entertainment were rendered at the entertainment arena and a mini flea-market (with jumping castle and face-painting for kids) kept patrons occupied. The event was graced by the Deputy High Commission of India, Mr Armstrong Changsen and Miss Earth (Fire), Miss Aurelia Nxumalo. Vibrant MC’s Avin Moorley, Aasra Bramdeo and Sureshnie Rider kept the crowd entertained. Free HIV testing and counselling was provided by Right2Life and a motivational talk provided by Sapna Kalyan. 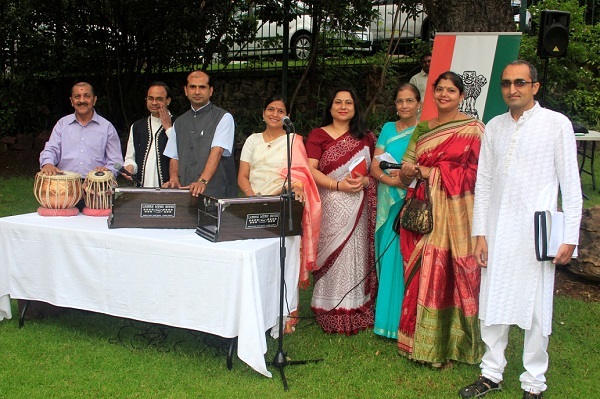 The event commemorated the birth anniversary of the Mahatma, promoted peace and non-violence in the community and also provided a platform for the community to enjoy a day out whilst networking with others. This was a charity event and funds were donated to the Dove’s Nest, a Home of Safety for orphaned and abandoned children in Centurion. Chairperson of the Centurion Hindu Society, Rekha Bennideen said that Pretoria was very significant in the life of the Mahatma, as many of Gandhi’s battles were fought here. Gandhi arrived in South Africa to fight a legal case in Pretoria. On his way from Durban to Pretoria, he was thrown-off a train in Pietermaritzburg because he bought a first-class ticket and sat in first class. Non-Whites were not allowed to ride on first class. Upon arriving in Transvaal, he was refused a hotel room and was not permitted to eat dinner in the hotel’s dining-room because he was non-white. Non-whites were also compelled to carry “passes” and register their presence in the Transvaal. The celebrated notions of Satyagraha (holding onto Truth), Ahimsa (non-violence) and Sarvodaya (upliftment of all) evolved in South Africa, demonstrating to the world how non-violent means could be used as an effective tool to fight for injustices hurled by an oppressive government.